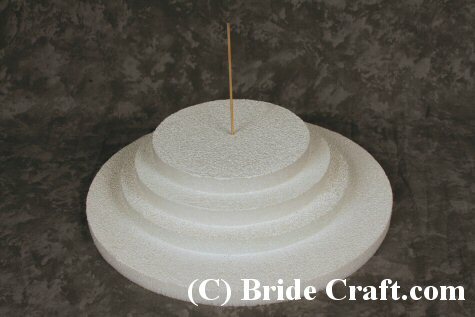 Looking for an adorable way to display your cupcakes come wedding day? 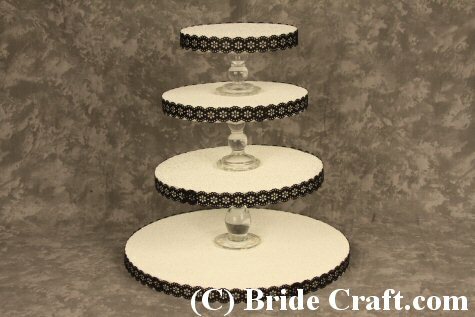 Consider this elegant diy cupcake stand! 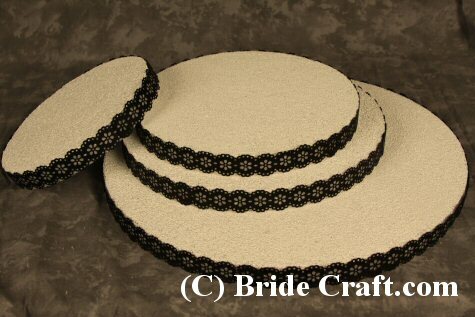 Quick, cheap and completely customizable to fit your wedding day look and feel. Pros: Quick and easy! Very customizable and fairly affordable. This stand looks elegant when completed. Cons: Easy to not use enough glue and to not center the disks correctly. Which can spell disaster. Take your time! 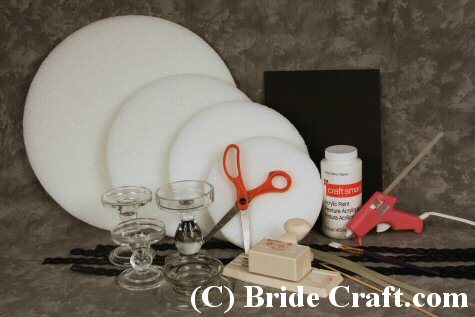 Step 1: You will need 4 graduating sizes of styrofoam disks, 3 thick glass candle stands, scissors, a hot glue gun and plenty of hot glue, black craft paper, a decorative border paper punch (we used a fab Martha Stewart lace patterned punch), acryllic paint, paint brush and a long bamboo skewer. Step 2: Take the time to prime the front and back of your styrofoam disks. 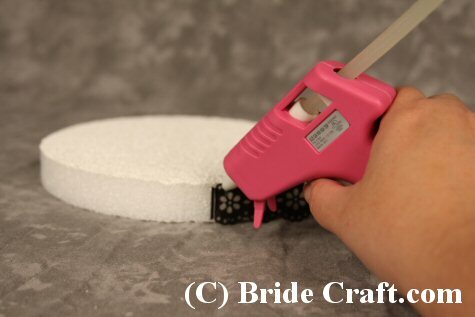 This will help keep tiny pieces from flaking off onto your cupcakes as well as giving it a smoother look than the unfinished foam. 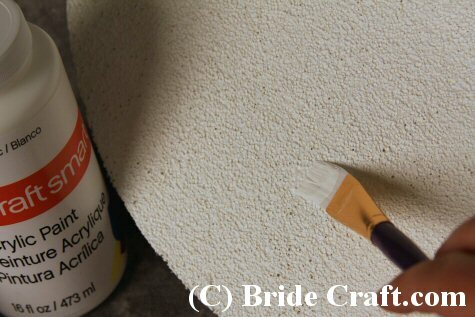 Tip: Wait patiently as the paint will not dry quickly on this pourous surface. Step 3: Center your styrofoam disks one on top of the other. Then insert the skewer through the middle and down through each layer. 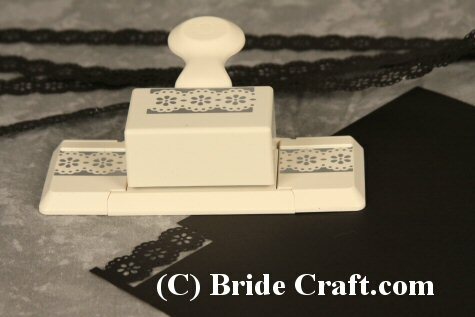 Step 4: Using the border punch create strips of decorative paper borders. Make enough of these to go around the edges of each disk. Step 5: Proceed to wrap the paper borders around the edges of the styrofoam disks and secure them carefully with hot glue. Step 6: Your styrofoam disks should look like this. 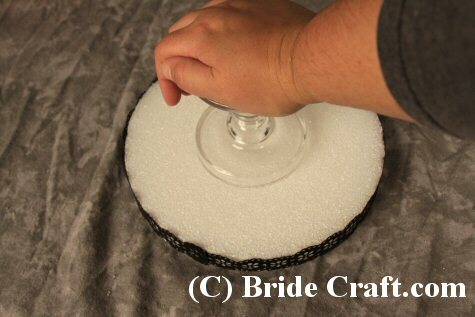 Step 7: Take the glass candle sticks and use the hole that was created by the skewer to measure up the center. Press the candle stick into the styrofoam to create an ident. Tip: If your candle stick does not have an indent, use a light colored marker to trace around the edge. Step 8: Line the edge with hot glue as thick as possible, as shown. 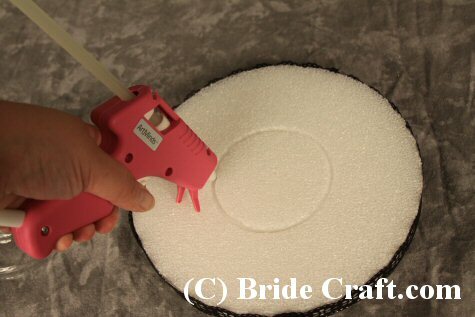 Then press the candle stick securely into the glue and let it cool. Step 9: Your cupcake stand should look like this! Store and transport carefully. Enjoy!